Why compete in hillclimbs in a Fiat Panda, albeit a 100HP, when it will never be competitive in the up to 1400 cc class? The answer is for fun and for challenges other than being the quickest in class. Some people compete in handicap championships, others compete in championships that reward personal improvement. I love trying to beat my personal best time (PB – Personal Best). When you do it, you feel totally elated and cannot wait to return to do it all again. When you fail, you wonder why you spend all the time and money on this sport when you could be doing other things. This weekend I spent a good deal of the time with Ken Morris who competes in an MX5. Ken’s real aim was to better Tony Thomas’s Prescott time of 53.62 set on 14 June 2014. We all know each other and all once competed in that MX5 class so knew exactly what set up Tony had. It would be a tall order for Ken to beat that time with his smaller engined Mk 2 and with List 1A tyres, but he was getting close. On Saturday he recorded 57.01, 55.15, 55.33 and a PB of 54.74. A PB is always good to get but not as satisfying as getting whatever target you have set yourself. For my part, the rest of the competition was irrelevant. My sole aim was to beat Laurence Marks best time in the Panda (Laurence owned it before me). That time was 58.54 set on 4 September 2016. My best time up until Saturday was 60.44 so, like Ken, I was pleased to beat that four times – 60.16, 59.35, 59.57 and 59.25. But, like Ken, the real prize eluded me. So we returned on Sunday to have another go at it. Ken was full of ideas of how he could do it and did a slow first practice of 59.32 as he concentrated on the technicalities of his lines. Then after first practice he and I stood on Orchard (bend), with Graeme Williamson (Hillman Imp) watching other competitors and analyzing where the best turn in point was. I think Graeme and I thought the best course of action was to stay in the middle of the road and not go near the grass, but Ken was convinced there was an optimal line, that we should stay out to the right and turn in only where the road surface changed colour and the grassy bank started. Ken did a 56.34 on his second practice, still experimenting and still chasing Tony’s 53.62. For my part I was pleased with two PBs in practice – 58.96 and 58.91. Getting closer to Laurence’s 58.54. Then it was lunch. We talked endlessly about the quickest way up. I sounded out people on tyre pressures and whether it might be quicker to go into first gear for Pardon (Bend). Whether you should brake or just lift off before Semi Circle at the top. Lynne Gilbert, who had sprained her ankle the day before and could not compete on the Sunday, watched me go around Ettore’s Bend and provided a few more pointers. Stay left and go deep before turning in. Only two more attempts! My first competition run was 59.10. Slower! On looking at the print out in the timing hut it seems I had lost the time at the top and at that moment I knew that I might leave Prescott full of doom and despondency if I failed on my second and last attempt. What a waste of time! Ken did a 55.70. A second slower than he had done the day before. We were both apprehensive. On my second run I did Ken’s turn in at Orchard, I followed Lynn’s advice at Ettore’s, I didn’t try first at Pardon and I didn’t brake before Semi Circle and hoped the tall little Fiat would not understeer off the edge. I crossed the line and drove slowly down the return road, watching for the digital clock that displays your time as you start your descent. 58.31! A PB and more crucially 0.23 seconds quicker than Laurence. I got out of the car at the bottom and Ken was already there and I knew instantly that he was not a happy man. 55.75. I felt on top of the world and could not wait to do it all again. I guess Ken felt it was all a waste of time. Yet he will be back, and he’ll keep chipping away at that elusive time and one day he’ll do it and feel on top of the world. No one else will know or care and no one else will appreciate it if he does it, but he will know. And that’s the thing. That’s why so many of us, in seemingly uncompetitive cars compete. Because there are still challenges and there are still metaphorical trophies to be won in slow old Pandas and Mk II MX5s. And that’s why it’s a great form of grass roots motorsport. We’re on the same programme as super fast Porsches and Ferraris and single seater race cars and we can face equal challenges to their drivers. So a good day for me. Less so for Ken. You can look at the results sheets and see who won each class and know those guys had good days and you can see the bent crashed cars like the 1963 Sunbeam Alpine that crashed at Ettore’s and know its driver had a bad day, but most of the ‘results’ are known only to those who challenge themselves on the hills. The good thing is you can do that in a Porsche or a Panda. I think that’s enough words! Here are some photos I snapped when not driving. This is Simon Dodwell. His Mk I Panda caught my eye immediately. In fact it is a SEAT rather than a FIAT and a Marbella not a Panda. But essentially the same. Except this one is a four wheel drive and into which Simon has transplanted a turbo charged Lancia engine. Unfortunately for Simon he engineered this little marvel without consideration of the MSA class structure which has resulted in his having to run in Sports Libra with everything else that doesn’t fit into a normal class. This was Simon’s first visit to Prescott and he got the little SEAT up in 57.84 seconds. Graeme Williamson in his Imp. He too had a good weekend, claiming a PB of 58.85. Here’s another classic small car going quickly. Very quickly. This highly modified 1957 Austin A35 got to the top in 54.01 seconds, faster than many much faster looking cars. It isn’t all about small cars though as the following photos prove and the FTD (Fastest Time of the Day) was set by Robert Kenrick in his BMW powered GWR Raptor 2 – 37.94 secs. 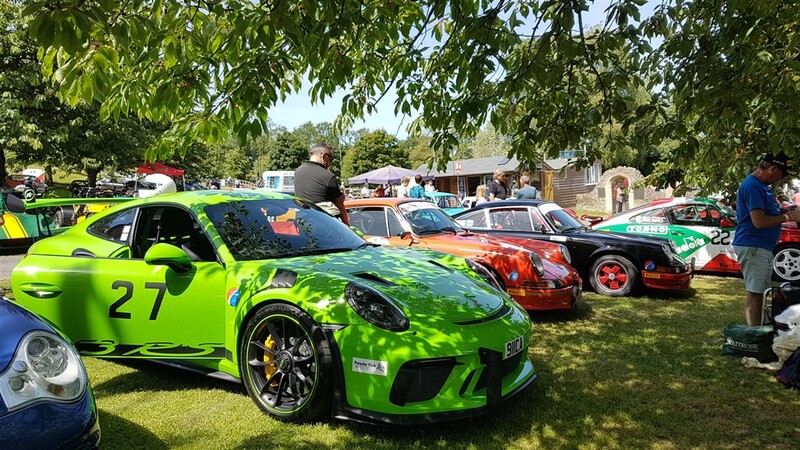 Next time out – 14 July at Loton Park. Ha! I need all the help I can get! So did you ever do Loton? That’ll be my next challenge, though I know it a lot better than I know Prescott. I think you were right about tyre pressures by the way. I was reducing them all day. If I had had more runs I would have got to where you were. I finished with 26f 24r. Best wishes, Bob.